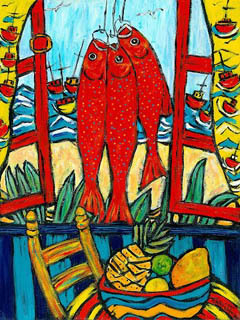 These tropical pictures, which have taken on new life as reproduction giclee prints, have been chosen from the most popular of Terry's paintings. Speaking about the inspiration for his work and his working methods, Terry says, "My work explores styles that tend to use some realism, such as background, perspective, directional light and so forth. But from here my own aesthetics and imagination take the work to another dimension, which uses abstraction, texture, patterns and exaggerated colours. I like to create work that elicits emotions of a surreal and dreamlike state of mind, a softness of edges, space and, of late, nostalgic use of colours". 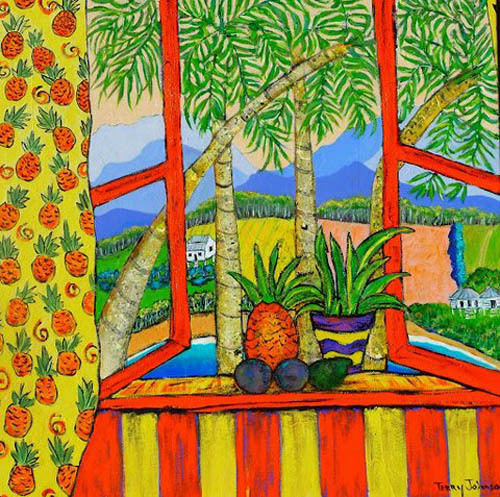 'Passion for Pineapples', giclee reproduction on paper. "Some of my favourite techniques are sanding back the surface of my painting, scraping into a painted surface and the addition of gold and silver leaf to construct interesting metallic patinas. I am a colourist and love it. To me, colour in a painting is like a sunny day or a friend's smile." 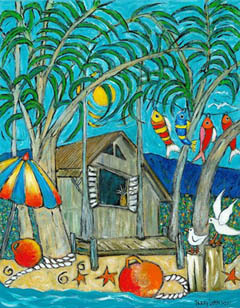 'Goin' Troppo, Port Douglas' giclee print on paper. 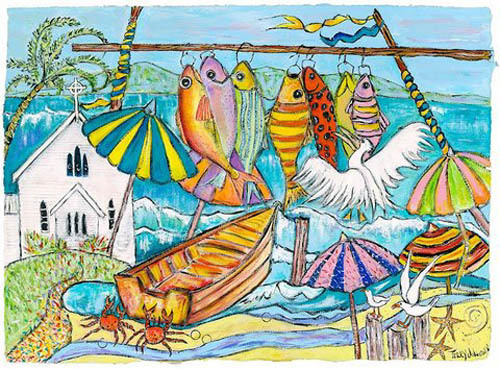 Terry's use of strong and vibrant colour is evident in these pictures of tropical fish, fruit and scenes of tropical beaches and lifestyle. The images on this page have been turned into high quality giclee prints by 'our own' well-respected artisan/printer, Lee Middleton, used by many of the North's best artists. The giclee process is described here. 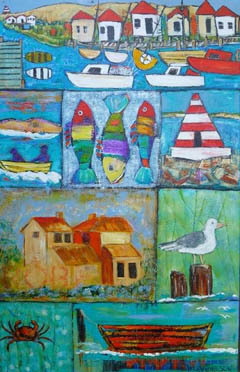 More of Terry's giclees here. Please fill in the form below to order your tropical picture or to enquire further. Which prints would you like to purchase?